Apollo XIV 45th anniversary special event. February 5-6, 2016. Hexagonal Beam Antenna Presentation by Rob Conklin N4WGY – October 2014. Article by Gary Agranat WA2JQZ. Recommended Reading, by Rob Suggs KB5EZ, July 12, 2015. Wading in to the Contest Pool, by Rob Suggs KB5EZ, August 2, 2015. Members of the Marshall Space Flight Center Amateur Radio Club (MARC) will be participating in the national Amateur Radio Field Day exercise, June 23–24 at the Von Braun Astronomical Society Observatory on Monte Sano Mountain. Club members will construct 2 temporary stations on the observatory grounds: one for voice communications and the second for Morse code and digital modes. There will also be a satellite station to communicate through one of the amateur radio satellites currently operating in earth orbit. The event is open to the public. People are encouraged to come out and see what club members are doing, find out more about amateur radio, and even get on the air. Since 1933, ham radio operators across North America have established temporary ham radio stations in public locations during Field Day to showcase the science and skill of Amateur Radio. For more than 100 years, Amateur Radio — sometimes called ham radio — has allowed people from all walks of life to experiment with electronics and communications techniques, as well as provide a free public service to their communities during a disaster or emergency, all without needing a cell phone or the Internet. Field Day demonstrates ham radio’s ability to work reliably under any conditions from almost any location and create an independent communications network. More than 35,000 people from thousands of locations participated in Field Day in 2017. Anyone may become a licensed Amateur Radio operator. There are more than 725,000 licensed hams in the United States, as young as 9 and as old as 100. And with clubs such as MARC, it’s easy for anybody to get involved right here in North Alabama. For more information about Field Day or Amateur Radio, contact Don Hediger (N4MSN) MARC President 256-544-1692 or visit http://www.arrl.org/what-is-ham-radio. 2018 is a big year for NASA anniversaries and the amateur radio clubs at NASA centers would like for you to help us celebrate. It will be 60 years since NASA was created, 50 years since NASA orbited the first man around the moon, and 20 years since the first elements of the International Space Station (ISS) were launched into low-Earth orbit. Note that there will be other special event operations by the various centers commemorating and celebrating specific events, but those listed above will include participation from most of the clubs. All operating modes are fair game including “space” modes such as satellites, meteor scatter, EME, ISS APRS, etc. We hope to be on the air for casual contacts and contests as well. All contacts with NASA club stations will count toward your total. QSL cards can be requested from each club you work and details will be on the individual QRZ.COM pages for each club callsign. Check back for direction to further details of the event and information on how to check your contacts and obtain a certificate at the end of the event. Please help us celebrate this significant anniversary year for your space agency. We look forward to working you! The participating amateur radio clubs, and the NASA On The Air (NOTA) event activities are independent of, and not officially sponsored by NASA. The Marshall Space Flight Center ARC, NN4SA, will be participating in field day on June 24th and 25th from the Werner von Braun Planetarium on Monte Sano. Club/Organization Sponsor Marshall Space Flight Center ARC, Huntsville, AL. Apollo 16 was the first mission to visit the lunar highlands. John Young and Charles Duke spent 71 hours on the surface while Ken Mattingly remained in the Command Module in lunar orbit. There were 3 EVAs each using the Lunar Rover developed at MSFC. More details on the mission are available here. John Young flying high in this photo taken by Charlie Duke. NASA photo. National Parks On The Air Oct. 22nd. NN4SA will be activating Little River Canyon National Preserve as part of ARRL’s National Parks On The Air (NPOTA) initiative. This event will occur on October 22 and begin at 10 AM. The day of activities will include NPOTA activation, much fellowship, good food, and lots of fun. We would like to invite you and your team to join us. All NN4SA operators will receive an event poster, and an “activator” certificate (signed by the president of the MSFC ARC). Mostly, we hope it’s a fun event. On top of that, we will be activating Little River Canyon National Preserve! How cool is that! So, please come have food and fun. Operations begin when park opens @10AM, possibly earlier if we get everything set up and working before then. Operations until sunset, when the park closes all areas. Every once in a while we get a self addressed stamped envelope (SASE) for a special event that isn’t like the rest. Once we received one with a QSL card and no signal report. 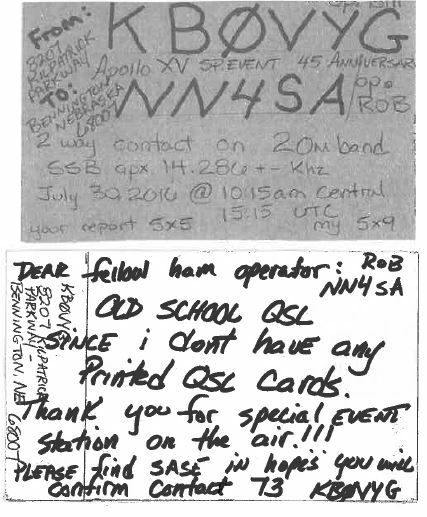 I’ve also received several printed pages with QSL information from folks who don’t either keep a cardstock, don’t often hunt paper, or are awaiting cards due to recent changes (location, callsign, etc.). Occasionally we get SASEs from Short Wave Listeners (SWLs). Today we received an “Old School QSL” in with the SASE. I felt that I should share it with everyone. Our station call sign is NN4SA. This website carries our current information. We were formerly WA4NZD, from 1980 to February 2015. We still have our previous website with past club information and posts: http://wa4nzd.wordpress.com. * Our monthly meetings are usually held on the first Thursday of each month at 4:30 pm, at the club building. Bldg. 4622. * We have a monthly Work-play session at the club on the third Thursday of each month at 4:30 pm. where is my space station ?